Serious question: When your dog looks in the mirror, what does he see? A playmate, maybe. An adversary, sometimes. But could he possibly recognize himself? For that matter — does a dog have a sense of “self”? These are abstract questions, and it is too bad for us that dogs can’t answer for themselves. And so, instead, scientists who study animal cognition have devised a test for measuring these hard-to-comprehend concepts, involving the use of one commonplace household object: the mirror. It’s called the mirror self-recognition test, and since its inception in the 1970s it has been considered be the “gold standard” of determining whether or not a creature possesses self-awareness. Elephants, chimpanzees, and dolphins are among the creatures who have passed, suggesting that these animals have a sense of self. But plenty of other primates, along with highly intelligent creatures like octopuses, are either confused by or totally uninterested in the mirror. It’s possible, then, that an animal’s failure to pass the mirror test says more about a human lack of imagination than the animal’s lack of a self-concept, as de Waal argues in his book, Are We Smart Enough to Know How Smart Animals Are? Because, think about it: Why should a mirror mean anything to most animals? 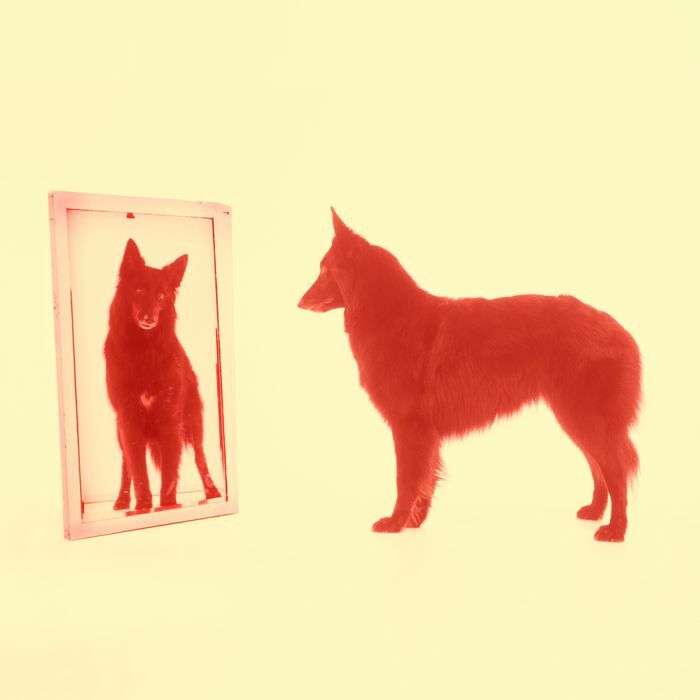 Some newer takes on the mirror self-recognition test are suggesting that self-awareness is less of a yes-or-no question, and instead exists on something like a spectrum — and some of the most creative work being done in this area happens to involve dogs. The link to self-awareness borrows from human developmental psychology. “In human development, when humans start to recognize themselves in the mirror at the age of about 2, that’s also the age in which they become very self-conscious,” de Waal explained. They start to show so-called self-conscious emotions, like pride or shame or embarrassment; they also begin to use personal pronouns, such as I and me. Recognizing yourself in the mirror, the theory goes, signals that you are at least beginning to grasp your you-ness. At least, that’s what it means for humans, and perhaps for other animals with brains like ours, which are highly attuned to social intelligence. But, then again, not every mind on Earth works exactly like a human mind. The human experience of the world is informed largely by what we see; for other animals, though, other senses are far more important. To return to our canine pals: Dogs have okay vision (they may not see colors as vividly as humans, but they are not color-blind), but they don’t understand the world through their eyes — they understand the world through their noses. Which is why, a few years ago, one rather inventive researcher created a twist on the mirror test, one that would make sense for dogs and their superior sense of smell. It also speaks to the necessity of finding new ways of testing or observing the concept of self-recognition in animals, ones that are tailored to the individual species’ interaction with their worlds. And some scientists are already taking on the challenge posed by de Waal in his book in some exciting ways. Octopuses, for example, have sticky suckers on their eight long arms that tend to attach to any surface they come in contact with — any surface, that is, except for their own skin, which could be the way an octopus demonstrates self-recognition. Or consider bats, which live in caves with thousands of other bats. “They fly out of these caves in the dark, and so they need to do echolocation while there are thousands of other bats doing echolocation at the same time,” de Waal said. “So all these shrieks are coming out, and they need to pick out the sound of their own.” This, too, could be a form of self-recognition. And that in itself is probably a form of self-awareness. “If you define self-awareness a bit more broadly, I would say every species has to have some of it,” de Waal said. “It’s a vague concept, and the boundaries are also probably vague.” Zooming out, the failures of the mirror test are a small example of the larger failures de Waal sees in the traditional ways of testing all sorts of intelligence in animals. “That’s really the challenge of our field,” de Waal added. “To find ways of testing animals on their terms, and their strengths.” This is about them, in other words— not about us.